Azerbaijan’s IPRI score increased by 1.091 to 5.037 placing it 15th in the Central Eastern Europe and Central Asia region and 78th in the world. Azerbaijan is classified by the IMF as part of the Commonwealth of Independent States group and by the World Bank as Upper middle income country. Azerbaijan’s Legal and Political Subindex increased by 0.267 to 4.109 with scores of 5.676 in Judicial Independence, 3.868 in Rule of Law, 3.633 in Political Stability, and 3.260 in Control of Corruption. Azerbaijan’s Physical Property Rights Subindex increased by 2.440 to 7.055 with scores of 6.321 in perception of Property Rights Protection, 9.828 in Registering Property, and 5.015 in Ease of Access to Loans. 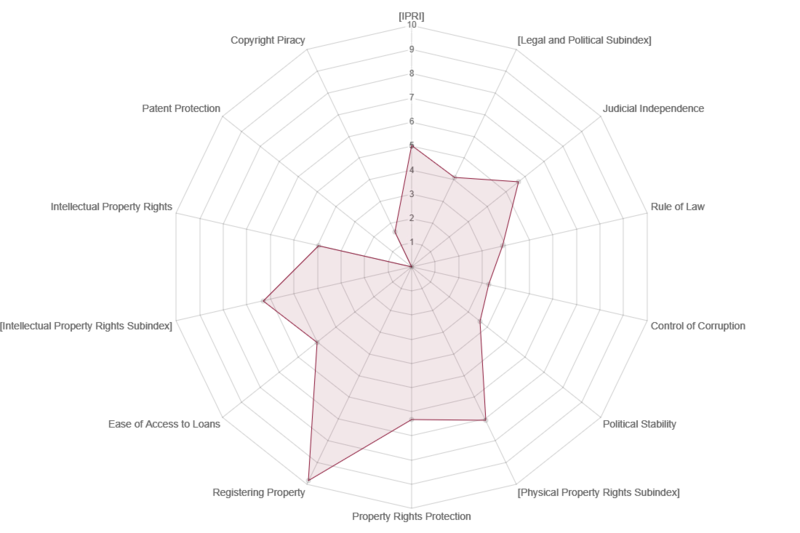 Azerbaijan’s Intellectual Property Rights Subindex increased by 0.566 to 3.948 with scores of 6.296 in perception of Intellectual Property Protection, data wasn't available to measure Patent Protection, and 1.6 in Copyright Protection.